Due to ill health, Bill Whaley and Dave Fletcher are unable to appear. 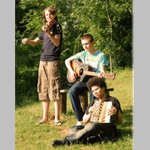 Granny's Attic is a young folk trio from the English Midlands, with members Cohen Braithwaite-Kilcoyne (melodeon, concertina, and vocals), George Sansome (guitar, vocals) and Lewis Wood (fiddle, mandolin, vocals). They play a variety of traditional folk music from the British Isles and further afield, complemented by original compositions. Granny’s Attic was nominated for the BBC Young Folk Award 2014. Their debut EP, 'Mind the Gap', was released in late 2011 and their first album, 'Better Weather' was released in early 2014. They imbue the tradition with a freshness, and vitality while respecting the source.